Chas. A. Lindbergh. From Victor catalog. An air mail pilot, the twenty-five year old Lindbergh took an offer from the French-born New York hotelier Raymond Orteig to award $25,000 to the first pilot to successfully complete a non-stop flight across the Atlantic ocean. Procuring a custom built Ryan airplane dubbed the Spirit of St. Louis, Lindbergh, the dark horse of the contenders for the prize, left Roosevelt Field on Long Island on the morning of May 20, 1927, and arrived in Paris on the night of the next day, creating what was dubbed the largest traffic jam in Parisian history. Becoming an overnight sensation, the hype surrounding Lindbergh was the largest media event of the inter-war years (we covered the third largest previously), Lindy was the 1927 “Man of the Year” for Time magazine, the topic of songs, and the likely namesake of that wildly popular dance craze, the Lindy Hop. 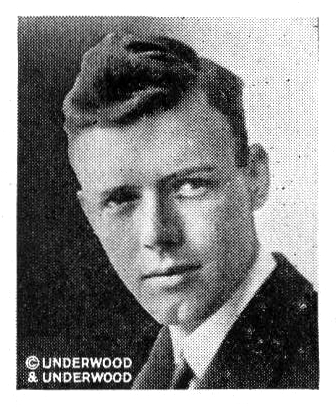 Herwin 75555 was recorded in May of 1927, mere days after Lindy’s flight, by Ernest Hare, and features two songs in celebration of Lindbergh’s historic transatlantic flight. It is a Paramount pressing leased from Plaza masters, and was also issued on Banner 1994, Broadway 1078, Regal 8326, Oriole 921 and 922 (with the sides split up), and possibly others. Hare was a very successful singer in the 1910s and 1920s, and is best known for his association with Billy Jones, who, as a pair, were known as the “Happiness Boys”, among many other names. The Herwin label was a St. Louis, Missouri label produced from 1924 to 1930 by brothers Herbert and Edwin Schiele, mostly using masters leased from Gennett and Paramount. On the first of the two Lindy songs sung by our Happiness Boy, Hare sings, “Lindbergh (The Eagle of the U.S.A.)”. 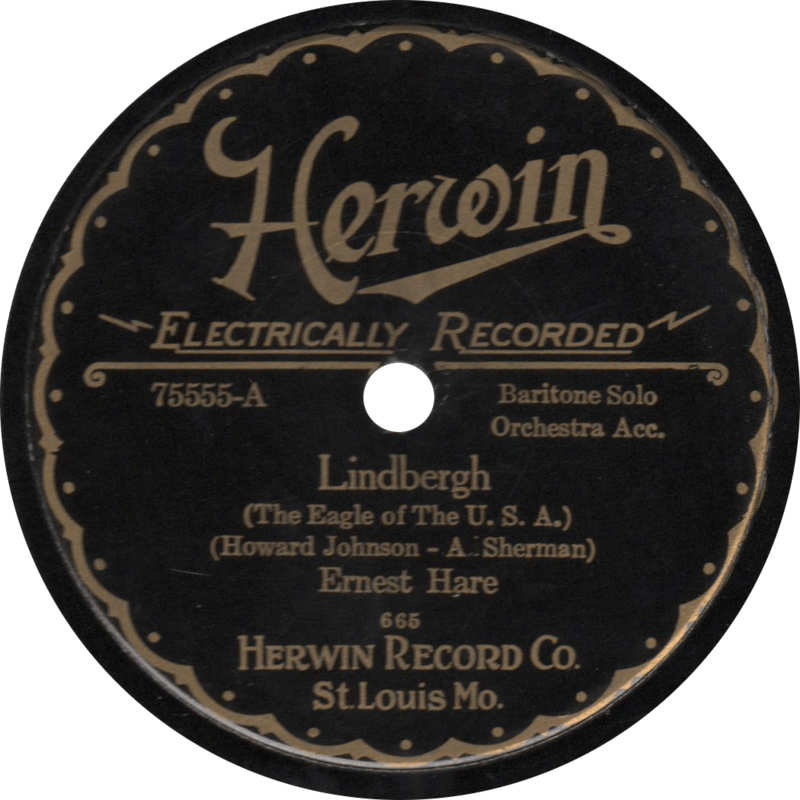 Lindbergh (The Eagle of the U.S.A.), recorded May 1927 by Ernest Hare. On the second, he sings L. Wolfe Gilbert and Abel Baer’s similar composition, “Lucky Lindy”. It’s been said that just about every song made about Lindbergh’s flight is terribly cheesy, and that’s about true, but I believe this one, as performed by Hare, is my favorite of the bunch. 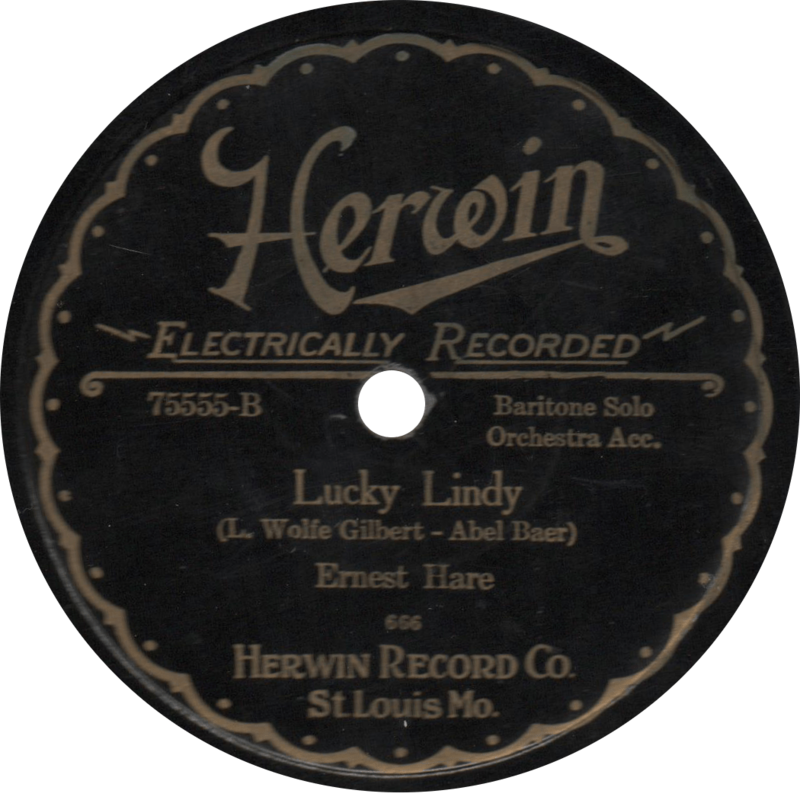 Lucky Lindy, recorded May 1927 by Ernest Hare. Updated with improved audio on June 29, 2017. This entry was posted in Records and tagged 1920s, 1927, Charles Lindbergh, Ernest Hare, Herwin, New York, NYRL, Plaza Music Co., Rare Labels, Topical Song by R. Connor Montgomery. Bookmark the permalink.